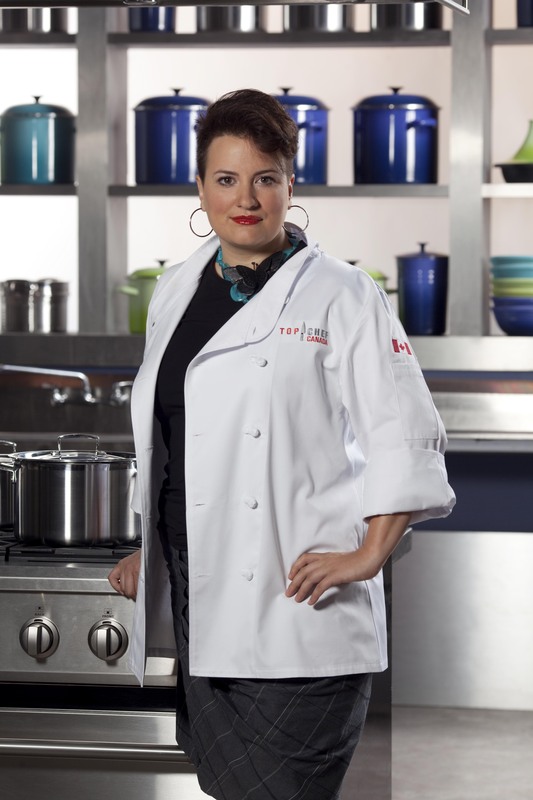 Here’s my interview with eliminated Top Chef Canada contestant and Alberta chef Rebekah Pearse. I’m a HUGE fan of Top Chef, mainly because I’ve always felt that the challenges (while extreme) reflected the unique skills that professional chefs need to have in their bag of tricks. Of course, getting some exposure for my business and the chance to win $100,000 was a big part of my motivation as well. If anything, it was an affirmation of what I knew already… that I make the best desserts of anyone I know, it’s what sets me apart from other chefs, and marching to the beat of my own drum is the only way to go. We were all allowed to bring 10 ingredients with a combined value of no more than $200 with us from home (hence Todd’s seal flipper). I brought tartaric acid, gelatin, citric acid, fromage blanc cultures, espelette pepper, cranberry honey mustard from Brassica Mustard, rose petal harissa, pickled cattail hearts, pickled spruce tips, Joel Robuchon instant stock sachets and organic Japanese matcha. As far as tools go, I didn’t bring anything crazy, just my favourite tongs and a quilting ruler. You were told to paint a picture of your partner with cheese. Other than the Quebec cheese, what did the rest of your dish say about Derek? It was hard to tell from the shots on the show – was the cheese underneath the meat and fruit? For starters, at this point in the competition I had made two simple, very cheese-focused dishes. I had received no feedback for them, and was worrying that I needed to show that I could branch out in order to get some recognition. On top of those silly head games, I over conceptualized the dish… I tried to make every component reflect my partner. First, I chose a Quebec cheese (Guillaume Tell, a gorgeous washed-rind cheese) and then chose to use veal as it was the only Quebec protein available. I asked Derek about his favourite flavours to cook with, and he mentioned cranberries and mustard, which made me think of the delicious Brassica mustard that I’d brought from home. Last, I needed a way to serve it, and I thought of the yummy buckwheat pancakes he’d made for his first challenge, so I decided to make a buckwheat blini as the base. All in all, there were some good ideas there, but to try to force them all to work together was not the best idea I’ve ever had. Your ability to make savory dishes was questioned in the competition. Was this dish a good example of savoury dishes that you make? Why or why not? I felt those comments were poorly thought-out, and were particularly galling to me as a classically trained chef and certified sommelier. Critiquing a flawed dish is fair. Saying you think it means someone doesn’t know how to cook or worse, taste? Rediculous. I think those comments were badly phrased sound-bites. As for whether it was a good example of how I tend to cook savoury… well, I hope not! As I said above, the dish had too many dissonant ideas going on, it had no focus. I like to think my signature style is simplicity, and I totally abandoned it for this dish. It did, however, have elements of the way I cook: veal blanquette is one of my favourite things to cook (and eat). Washed rind cheeses scooped out right at the table? I’m so there! You addressed the closure of Nectar Desserts in your blog (http://rebekahpearse.blogspot.com/2011/04/bankrupt.html), so Im not going to ask you about that. In hindsight, did this issue happening at home affect your ability to properly compete? Absolutely. I was jet-lagged, exhausted and underprepared when I got there, then continuously distracted the whole time I was on the show. My head was only half in the game, and looking back on that time, if I hadn’t been kicked off the show I would have needed to drop out. What advice would you give to anyone thinking of applying to be a contestant on Top Chef? Do it! Despite the fact that it didn’t turn out as I’d hoped, I got so much out of the experience, particularly the chance to meet so many cool people and participate in creating some pretty wicked TV! As far as how to get on the show? Be yourself. What are you doing now? Any future plans that you’d like to share? Will you be opening another business anytime soon? I just accepted a position as the pastry chef at a high-profile winery in the Okanagan. I’m SO excited about it! I’ve never spent a summer in a growing region (even when I worked in Europe it was in the winter and spring). I’m working on a follow up to “SWEET Seasonal Desserts” called “SWEET Chocolate Desserts”. The title is pretty self-explanatory and I hope to have it published this fall. I have no doubt that I’ll be opening other businesses in the future, but right now it’s just about waiting for the right opportunity and the right time. Other than where you are currently working, name one of your favorite places to eat. This isn’t a plug, I honestly LOVE Connie’s restaurant, Charcut [in Calgary]. She feeds me up good there on a regular basis. If you haven’t been, you need to go. A huge thank-you to my friends and family, but most of all to the crew at Nectar. I would never have been able to go on the show without them, and their love and support made everything not only possible, but worth it. To get you ready for tonight’s new episode of Top Chef Canada, here’s an interview with last week’s eliminated contestant, Michael Stauffer. First of all, congratulations on being chosen for the first season of Top Chef Canada! What was the selection process like for you? Thanks! The selection process was cool and nerve racking. It was kind of a last minute thing when I put the audition tape in (evident from the quality of said tape), and it seemed like forever before I knew if I was being passed through to the next stage. My friends were begging me to at least try! I thought it would be fun and a good experience. Also, a chance at $100,000 doesn’t hurt. The intense level of talent they brought in from across Canada. These guys and girls were good. Also, just how much work goes into production of these t.v shows. Haha…yeah, that drinking 5 cups of coffee before a quickfire challenge, does not make filleting a fish easy. Just some really good olive oil, a bottle of Saba, and some Asian seasonings that I figured they wouldn’t have. Can you explain the reasoning behind the food you created for your elimination dish? Did you intend to serve the lamb that rare, and why did you choose to use chevre in that way? Have you made this dish before? I had never made that dish before. I had made each component many, many times before, but never together like that. It was my thinking that we were to try and represent our personality on the plate. I think I read into that a little too much and tried to represent it literally. Transparent (consomme), Cheesy Humour (Chevre), Haldimand County (lamb – close to where I grew up), Mixture of Personalities (5 different veg cooked 5 different ways). The consomme was straight from France, I used heirloom tomatoes as they were height of season at the time and infused it with basil. The Cheese was definitely a bad idea, I had had this before at a restaurant and I loved it. The combination of the 120 degree kitchen and the 15 minutes of sitting on the plate before being eaten did not help, but I should have seen that before…that’s what being a chef is all about. But one thing I am still absolutely perplexed by, and I feel compelled to defend, is the doneness of the lamb. I have cooked lamb fillet 100,000 times at some of the top restaurants in Canada, and I have to say that without a doubt, it was perfectly cooked. Brought up to room temperature before, seasoned with olive and citrus, wrapped in caul fat, slow roasted with thyme, garlic, rosemary, bay-leaf, lots of butter and allowed to rest for the same amount of time that it cooked. When I cut into it, I couldn’t have been more pleased. There was no eye, and a perfect, juicy, uniform pink through out. I just didn’t get it. But according to the resident expert, it looked and tasted like vomit. I doubt Gael Green could have said it much more eloquently, but I’ll take it as constructive criticism and move on. If asked, would you compete on Top Chef Canada again? Sure, I would love to take another stab at it. I have been nailing down a rosticceria concept for the past year that I feel will become very big. It’s called Celli’s. We are opening our second concept restaurant in Burlington, Ontario and also a 30 seat dining room concentrating on a very stylish form of cuisine. I fully intend to put the lamb dish on the menu (probably change it up a bit though), and allow my guests to taste and judge for themselves! My backyard, end of August, next to my vegetable garden with Grimier’s Pride Tomatoes, Soldier Basil, Burrata Mozzarella still warm from Bella Casara, liter of Olive Oil, Saba, Grey Salt, Black Pepper, Crusty Bread, friends and 10 bottles of wine from Organized Crime in Niagara. Who would honestly want anything else? Would just like to thank all my friends and family for the unwavering support and I will continue to cook my heart out for them!! Thanks. I am interviewing all the eliminated contestants, so if you have a question that you want answered, let me know in the comments, preferably by the end of the broadcast night on which they are voted off. I make no guarantees about using your question, but if I do use it I will give you credit for it. Okay, so you all watched Top Chef last night, right? I’m not planning on recapping every episode because frankly, I just don’t have the time. But I did want to jot down some of my initial impressions and predictions (mostly spoiler free). 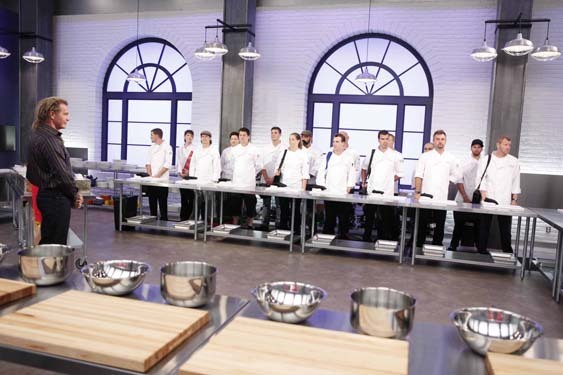 First, my impressions – I was pleased to see that many of the US Top Chef elements were there – the types of challenges, the interviews with the cheftestants, etc. It put a big smile on my face to see all those Canadian images in the intro. I do have some concerns about the chefs finding the ingredients that they need though. Loblaws, a main sponsor of the show, has a lot of items in their stores but I know they usually don’t carry stuff like venison and um… seal flipper (at least they don’t in their Edmonton stores – maybe it’s different in other parts of Canada?). I mean, sometimes I even have problems finding canned black beans in stock at my local Superstore! I’m sure that the show has thought this out though, and I am hopeful that this won’t be a huge problem for the duration of the show. Based purely on their audition videos, my top three guesses were Dustin Gallagher, Connie DeSousa and Dale MacKay, with Dustin winning. After watching the first episode, I would have to say that I am still relatively confident in Connie DeSousa and Dale MacKay. Not quite sure about Dustin now. It’s still pretty early yet, and time will tell. I’m excited. This is going to be a great show! I will be posting interviews with each eliminated cheftestant every week. You can read my past interviews by using this Top Chef Canada list. This is the last of my Top Chef Canada judge interviews. Even though I haven’t seen her in action yet, I have a feeling that judge Shereen Arazam will be my favourite (we do have the same name, after all). A native Torontonian, she now lives in Los Angeles where she owns and operates celebrity hotspots like Geisha House. 1. You’re a successful and busy businesswoman in the U.S. Why did you want to come back to Canada to judge Top Chef? I love Toronto, I’m a very proud Canadian, as you will find with many of us who live in the US. It’s an honour to be invited to judge Top Chef Canada and a thrill to come home for the summer. Thank goodness it didn’t shoot in January! 2. How did your past experiences as a bartender and a business owner, as opposed to being a chef, influence the way you judged the chefs? My experiences in the restaurant/bar business was first and foremost as a server and floor manager, much more on the food side. I was a server many more years than a bartender but all aspects of working in the service industry have helped my career. I’ve done EVERY job – I even washed the damn dishes at my first job at Terroni in Toronto! – and having done every position, from bussing to cleaning, to serving, to making drinks and to managing, has been invaluable. When you understand every position it helps you with perspective in your own business. I know a lot about cooking and food because it has been in my “job” for 20 years. I am not a chef, but I have worked with many of them, some great, some not so much – all of which I learned from. I know what “good” is and I know what works and what does NOT work or sell in a restaurant. 3. Did you find any differences in the food made by Canadian chefs vs. food made by U.S. chefs? Or in the chefs themselves? I didn’t necessarily find differences in the Canadian chefs compared to the American chefs. Good is just good, no matter where you come from. 4. Were there any surprises? I was surprised there weren’t more women I guess. But then again, I’m always surprised by that in this business at every level. There aren’t a lot of female owners and chefs, but I think that’s changing. 5. What makes Top Chef Canada stand out from all the other Top Chef tv shows? The thing that makes Top Chef Canada stand out from the other Top Chef shows is that it’s Canadian. It sounds like a no-brainer, but you’d be shocked how little some people know about Canada. Some Americans I have talked to, who have visited Toronto, Montreal, Vancouver, are stunned at the amazing restaurants and cuisine. It never ceases to amaze me how shocking it is to people who have never experienced Canada. The chefs on this season are literally from coast to coast. We have a chef from Newfoundland and a few from BC and they are all so talented and inspiring. 6. If you could give one piece of advice to someone who wanted to become a Top Chef competitor, what would it be? Some advice to any potential Top Chef competitors? Remain true to yourself and your gut. You are trying to win, but don’t get into your head and second guess yourself because of what other or judges have said. We gave them crazy tasks some times and most of them rose to the challenge, but listening to the little voice in your head will always keep you on track. BUT, remember it is a competition, bring your A game and compete to win. If anything it will be an experience you will NEVER forget. Top Chef Canada premieres on Food Network Canada, on Monday, April 11, 2011. I can’t wait! Oh, and stay tuned to this blog for more interviews with each contestant after they have been voted off. If you have a burning question to ask one of them, do let me know. Fair warning, I make no guarantees about using your question, but if I do use it I will give you credit for it. The earlier you can get it to me the better — preferably by the end of the broadcast night on which they are voted off. 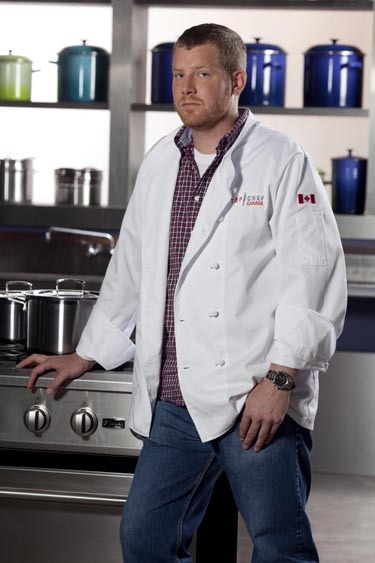 Next up in my Top Chef Canada interviews is head judge Chef Mark McEwan. He’s a busy, busy guy. Not quite sure how he found the time to answer my questions in between working on his growing food businesses, cookbooks, TV shows, etc. 1. You already have a number of businesses and your own TV shows. What attracted you to become a judge on Top Chef Canada? I really felt that it was a good fit due to my age and experience. It is a great concept and has worked well in the U.S..
2. Was the making of this series quite a bit different from your other TV shows, or did you have similar experiences? The whole concept of a competition show was very different for me. I really enjoyed the fast paced environment and learning the subtle nuances as well as where other, up and coming chefs have their strengths and weaknesses. In “The Heat,” I am working with my own staff and already know those types of things and have put staff members together to get the most out of them. Both have been amazing experiences. I believe that we are actually borderless except for the chefs from the southern United States that have different techniques and use different ingredients, creating a very distinct flavour. Many things surprised me, the extreme ups and downs of the chefs, both in their personalities as well as the way that they were affected by the different scenarios and challenges was the thing I really didn’t expect. It’s our own, it is true to our country and the diversity of our country. It is incredibly honest which I feel is very Canadian. TASTE-TASTE-TASTE!!! And don’t try to over achieve! One more interview coming up later this week. You can read all these interviews by using this handy dandy Top Chef Canada list. What if Batman and Robin had their own cooking show?